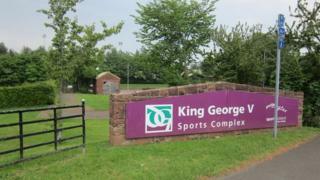 A former bowling green next to a sports complex has been selected by councillors as the preferred site for a "learning hub" in Dumfries. The land next to the King George V facility is also the favoured option of the EIS teaching union. The plan will now be the subject of public consultation with the Crichton Campus remaining another possibility. The £11m project is phase one of wider plans to improve education in the town, especially vocational studies. It will see two new secondary schools built and another two upgraded. Maryfield playing fields and the old George Street School of Art in Dumfries were also being considered for the learning hub location. The police headquarters at Cornwall Mount was removed from a report on the project after being included in error. Jeff Leaver, who chairs the education committee, said accessibility had been a key factor in picking a preferred location for the hub. "Unless pupils are able to move between facilities easily then that really cuts into the school day," he explained. "Outwith the time when the hub is being used for pupils, what we are looking for is community use. "King George V has got a very real advantage - it is easily accessible, it's very close to the bypass." He said it was also in north west Dumfries which was an area of "multiple deprivation" where there tended to be a greater need for retraining. Mr Leaver added that the location was also easier to get to for people from outside of the town.